As a part of MET’s 2 Decades celebrations, MET League of Colleges held its Annual Sports Meet on October 14, 2009. 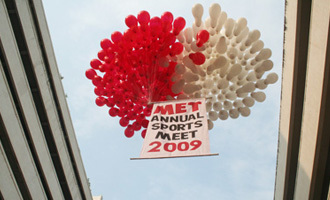 The event was inaugurated by Trustee, by releasing the MET Annual Sports Meet banner attached to the air balloons. The event was kicked off with great anticipation of fun filled sports action all day long. Right from the trustees, directors, senior staff to the students from the respective institutes took part in the action packed day with great ado and lots of expectations. MET Sports Meet trustees, directors, senior staff to the students from the respective institutes took part in the action packed day with great ado and lots of expectations.